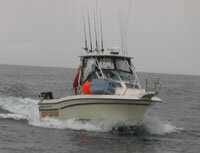 Westcoast Fish Expedtions runs four charter fishing boats, two 24 foot Grady White Offshores, and two 23 foot Grady White Gulfstreams. 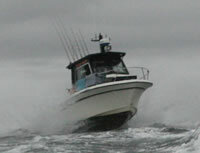 These boats are designed to catch fish efficiently and built to handle the rigors of the westcoast. Our Grady White Fishing Machines offer a safe, dry and comfortable ride, combining solid structure, self-bailing reliability, hull engineering and the finest craftmanship to create the ultimate offshore fishing vessel. 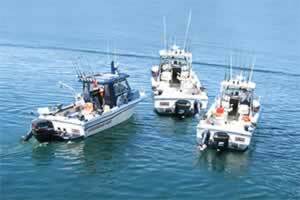 The Grady White advantages allow us to travel greater distances and track the migration of wild salmon and halibut from season to season. Our fleet offers protection from the elements, spacious decks and washroom facilities.All of the boats are equipped with the latest in electronics, fishing tackle and safety equipment. These boats will carry up to 5 guests comfortably plus the guide and on occasion will even carry up to six guests. 1986 Grady White 24 foot Offhore – the original boat at Westcoast Fish Expeditions has held up very well over the many years of abuse. This boat has a custom aluminum wheel house for warmth and comfort. The main power is a 2010 300 hp Yamaha 4 stroke and the trolling/auxilary engine is a 2011 25 hp Yamaha 4 stroke, both are mounted on a custom outbracket/swim platform . The boat has a toilet, forward and aft steering stations, 3 Scotty electric downriggers, G.P.S chart plotter, Furuno fwd and aft fish finders, Furuno Radar and 2 VHF radios. 1992 Grady White 24 foot Explorer – this boat has the newer version SeaV2 Hull designed by Grady and therefore is the smoothest riding and most economic boat in our fleet. This boat is powered with a 2012 300 hp Yamaha 4 stroke and 2011 25 hp Yamaha 4 stroke both mounted on a custom outbracket/swim platform. The boat has a toilet, forward and aft steering stations, 3 Scotty electric downriggers, Standard Horizon G.P.S chart plotter, Furuno fwd and aft fish finders, Furuno Radar and 2 VHF radios. 1991 Grady White 23 foot GulfStream – this boat is 1 foot shorter in length, but it has a 1 foot wider beam than the 24 foot gradys’ making this a very roomy boat. The 23 foot GulfStream has a 2012 300 hp Yamaha 4 stroke and 2012 Yamaha 25 hp, 4 stroke kicker engine both bolted to a custom outbracket/swim grid. The boat has a toilet, forward and aft steering stations, 3 Scotty electric downriggers, Standard Horizon G.P.S chart plotter, Furuno fwd and aft fish finders, Furuno Radar and 2 VHF radios. 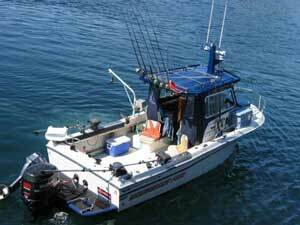 1993 Grady White Gulfstream is 23 feet in length and has a 9.5 foot beam making it the ideal fishing platform for the sea conditions on the westcoast of Vancouver Island. This boat has more than ample fish storage, roomy aft deck and cuddy cabin with marine toilet and bunk. The hull deign is the SeaV2 style, making it a smoother, drier and more economical ride. The boat was fully refitted with forward and aft steering stations, new electronics, custom motor bracket, and new 2011 300 hp Yamaha 4 stroke outboard and 2012 Yamaha 25 hp kicker engine. There are 3 Scotty electric downriggers, 1 Standard Horizon GPS, Furuno color fish finder, Furuno radar and 2 Icom VHF radios. See the live Ucluelet Webcam here. All anglers must have a licence to go fishing. 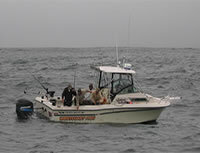 Many fishing locations do not have a licence vendor, making it best to acquire your licence online before your head out. Remember to always carry your licence with you. Get info about licences here.